I am trying to find the positives in going back to work, even though at this point I really don’t want to go back to work. It will be nice to have some time and space to think again. It will be nice to have some quiet. I was home this summer with both kids, and while it was in many ways a lot of fun, it most certainly was not quiet. It will be nice, I suppose, to think about my research again. Perhaps I will actually make the revisions the press requested for my book (two YEARS ago. Gah.). Mostly I am looking forward to being able to make the time to exercise and to occasionally have lunch with a friend. When E. was little, I found it hard to rationalize doing anything for myself that wasn’t work-related, because if I wasn’t home with E., that meant Q. was, and that meant Q. wasn’t working when he should have been. It felt inappropriate and frivolous to use my time away from E. for anything but the PhD. This time around, it’s different. Three days a week P. has a nanny. It is the nanny’s JOB to take care of P. She is not supposed to be doing anything else. So if I want to use an hour of that time to go for a run, or to eat lunch with a friend, I shouldn’t feel guilty, because the only person whose work isn’t getting done at that point is me. In my view, life’s too short to work all the time, even if I’m supposed to be maintaining full-time hours in my research position and I’m already behind by choosing to stay home with P. one day a week. I do better work when I make time to read for fun, when I make time to run, when I make time for anything other than sitting in a library staring at a computer screen with a pile of books stacked next to me. This does not make me a particularly good academic, but it makes me a better person and a much better mother. I don’t want to be back at work next week. I would much rather still be at home with P.
I would much rather be the one picking E. up after school every day. But if I’m not going to be able to do that, at least I can try to make sure that my time away from them is well spent. And that means making time for me, not just for my research. I am hitting a wall over here. P cut back her nursing about a month ago and I immediately gained a bunch of weight. It’s not a large amount in the grand scheme of things but it’s enough that some of my clothes don’t fit as well as they should. I have an equilibrium weight that my body likes to sit at and I’ve strayed far enough away from it now that I feel even more sluggish and tired than I would from the sleep deprivation alone. The last time I had my hair cut was back in August, a “get ready for the funeral” haircut. That was also the last time I had my eyebrows tidied up. I have yet to do any form of exercise beyond chasing my children around and walking E. to and from school. I need to go to the dentist. I normally go every three months because my gums are problematic but my long-time hygienist had a baby in February and is on maternity leave and I haven’t made the phone call to change to the dentist closer to our house where both Q. and E. go. I also can’t remember when I last had x-rays done and I’m worried my teeth are full of cavities because P. sucked out all the calcium. I started eating dairy again because P. seems to be able to tolerate it in my diet now and as soon as I had any real milk my face broke out. This coincided with the drop in nursing and the weight gain so there might be a larger hormonal shift happening as well. It’s really starting to be spring outside which means I’m not swathed in my usual winter jacket and sometimes P. is eating sand on the ground at the park which means I don’t have her in the carrier, and I need to stop turning up in ancient yoga pants and an ill-fitting sweater (especially since the last time I did that we ran into E’s best friend and ended up having a spontaneous pizza dinner at their house with two other kids and their mothers, whom I’d never met before, and who were appropriately dressed in skinny jeans and flattering tops and cardigans). I feel fat and ugly and tired and old (and really, only one of those is true). With E. I joined a boot camp with two of my mum friends. Right now I’m just desperate to make some time to run. I want to start the Couch to 5K (again, sigh). I know I need to start from the very beginning. I miss running. It is good for my body, obviously, but it’s also really good for my mind. Nothing else has ever helped as much to manage my anxiety. I need three sessions a week. One can be on Friday afternoons when Q. takes the kids. One can be on Sundays at some time that works. And then the third needs to fall on Tuesday or Wednesday. Mornings are out. P. is totally unpredictable with when she wakes up (except this week it’s been 5:30 a.m. or thereabouts every morning, which is really getting tiresome). Daytime is out, as I sold the jogging stroller I bought (and NEVER USED) when E. was a baby. But it’s light enough now that I think I could get P. to bed at 6:30 p.m. and then go for a run while E. and Q. were eating dinner. I’d have to eat dinner after them, and Q. would need to put E. to bed that night (it’s not that he would mind, more that we’re in a rut where E. fights tooth and nail if his father does anything- he wants me to do it all), but it could work. I need to make some space for me. For the reasons why I decided to put myself through a happiness boot camp, see here. For the first three spheres in my boot camp, Parenthood, Marriage, and Work, see here, here, and here. I knew from the outset that SELF would be one of my spheres. I am not good at taking time for myself, or prioritizing things that are good for me but not necessarily immediately useful for the family. I have a great life. I needed to work on my attitude to make sure I could see that. I completely fell off the wagon when it came to running. Stopping for the FET in late October meant I never properly restarted when it got dark and cold. And then it was dark and cold for so long. I originally thought of making a resolution regarding running, but I don’t know what’s going to happen over the summer. If we do decide on one last round of IVF, that will certainly interrupt things again. So I opted to keep it general. This will probably make it harder to keep, but I figured that any level of exercise (above and beyond the daily walking I do when I’m out with E.) would be an improvement. I can always tweak it in the coming months if I find it’s not working. I’m thinking of borrowing a pedometer from the library to see how many steps I take in an average day. To keep this resolution, I have to make time for exercise four days a week. I’ve lost count of how many of my friends have aggressively changed their diets over the last couple of years. I have friends who have gone paleo, gluten-free, and vegetarian. I have other friends who have embraced a low-carb/ketone diet, or have given up grains, or sugar, or processed foods. Many of them have been thrilled with their new lifestyle and with their results. And I’m happy for them that they’ve found something that works. When I sat down and looked at my diet, I kept hitting one stumbling block. Nothing I can eat or not eat is more important to me than family dinners. And a family dinner, for me, is one where we all sit down together and we eat the same food. E. has been eating the same food as us since he first started eating solids (one of the advantages of baby-led weaning). He’s come out of his pickiest stage (we are also pushing him a little bit more to make sure he at least tries everything) and is becoming, if not adventurous, a solid eater. So some nights we have pasta, because E. loves it, and some nights we have pizza or a meat pie, because Q. loves those, and some nights we have a vegan stir fry, because I don’t want to eat meat every night. On the whole, I think we have a pretty good balance. We eat meat probably three or four times a week, and the meat we buy comes from our farmers’ market, so I know it’s from pastured animals. We eat only whole wheat pasta. We do most of our baking with whole wheat flour (although not all of it). And 95% of our food is homemade. We make our own bread, salad dressings, pizza crusts, soups, curry pastes, pasta sauces, sausages, etc. I don’t want to give up anything that’s going to require me to eat differently from my husband and my son at supper. So I didn’t set myself any strict food rules. I decided instead to be mindful, because a lot of the time my eating is mindless. I don’t need to go back for seconds. I’m in the habit of doing so because everything Q. cooks is so delicious. I don’t need to buy sweets or treats. If Q. makes something, I will eat it, but there’s no reason to be buying candy, cookies, pastries, etc. from shops. I don’t need to make lunch in five minutes or less. I have enough time, given I’m at home, to plan a menu. Just because E’s having a tuna melt doesn’t mean I need to as well. I don’t need to finish E.’s leftovers, or eat a snack just because he is. I’ve reached my adult height. I know I feel better when I don’t eat much sugar, but I’m not willing to cut it out entirely. But I know I can be much more conscious of when and how I eat it. A number of books I’ve read, including Rubin’s, have discussed the idea that if you want to feel more affectionate towards someone, the key is to just start acting in a more affectionate manner. If you hug someone more often, you’ll have warmer feelings towards them. The same can be applied to most emotional states in your life. The night guard is making a huge difference. My jaw hurts so much less and it’s much more obvious to me now when I start clenching it during the day. But needing the night guard in the first place was what made me realize I needed this resolution. It’s too easy for me to act stressed when I’m not really stressed. Stressed and slightly frustrated seems to be my default mood of late. This resolution is meant to help me change that pattern. I’d like my default state to be calm, loving, relaxed, even if E. is driving me crazy and I’m having trouble with the dinner. I’m tired of bottling up tension. This will be a tough one for me, but I know it’s worth it. Not clinically, at least, not yet. But I’m definitely in a major slump. I’m crying a lot and sleeping a lot and I feel tired all the time. Everything exhausts me. Part of it is weather-related, because this time of year is always so dark and cold, and even though it’s not all that cold right now, it is so dark for so long. Part of it is lack of exercise because I stopped running during the tww in our last FET and then didn’t start up again because (see above) it was cold and dark in the mornings and E. started waking up unpredictably early. Part of it is Christmas burnout. This is the first year I have really, really not wanted to be buying presents. It’s just felt overwhelming. Q. and I have decided to do “presence, not presents”, so we’re each in charge of organizing six dates over the the course of 2015, which I’m excited about. I’m also in discussions with my family to stop gift exchanging (other than for E. of course). Anything we really want/need we can afford to buy ourselves, and I’m so tired of buying stuff to give to people because they’re going to buy stuff to give to us. We have so much. Too much, really. Part of it is trying to engage with the end of treatments. Today I packed up a duffel bag of clothes and three bags of books and toys for the son of a very dear friend from high school (we’re going to see them over the holidays). I felt both happy and relieved to be able to give them these things and heart-broken that we were able to give them away because we were never going to need them ourselves. Part of it, a big part, is missing the little person who was supposed to be here but isn’t. And part of it is finishing the PhD. I didn’t think this was going to affect me as much as it has- I handed in the final draft of the dissertation in early October and I didn’t touch it again until December, so I thought I’d had a break from it. But I was clearly still focusing on it, even unconsciously, because ever since the defence (and the celebratory party the day afterwards), I’ve been out of sorts. I haven’t googled it, but I would bet money that feeling depressed after finishing a PhD is completely normal and probably expected. After all, I’ve spent the past six years working on it. It’s not helped by the fact that I’m not starting a new job immediately afterwards. I’m still figuring out what I want to do and what will work with our family. So there’s a lot of uncertainty and not a lot of answers right now. I know that will change, but the here and now is a challenge. I’ve been trying to push everything down until after Christmas, but it’s not really working. So, as of today, I’m trying something new: acknowledging that this probably won’t be my best Christmas, but there will be other years ahead when I won’t feel this way. I’m giving myself permission to grieve, to mourn, to feel adrift. It is a year of endings, after all. And now that I’ve dumped out how I’m feeling, I’m going to turn off the computer and go for a run while the sun is still shining. For the first time since we moved back to a country which celebrates Thanksgiving, we haven’t left the city. Yesterday Q., E. and I sat on the couch together and watched Finding Nemo, and E. got all the way through it, even if he spent much of the movie with his stuffed Puppy on his head, ready to drop in front of his eyes if he became too frightened. Then we sat at the table together and ate roast beef and roasted potatoes and carrots and bumbleberry pie with homemade ice cream for dessert (because Q. really is that amazing) and E. talked non-stop about the movie, about French vocabulary, about how the digestive system works, about why Pluto isn’t considered a planet anymore, and about all the chilis we harvested from our garden. He paused only occasionally to look into his bowl to see if some small portion of pie or ice cream had escaped his spoon. Then he went to bed, and Q. and I lounged around on the couches reading books, and I read for fun and felt no guilt because all four of my committee members have given the green light to my dissertation and it’s out of my hands now until I defend. We went to bed and I stopped in at E’s room, as I do every night, to adjust his covers and give him a kiss. This morning I woke up early and ran through the streets, ran long enough and far enough that my mind stopped churning and I could just breathe and be. I am healthy and happy. I love and I am loved. 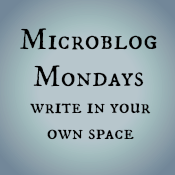 This post is part of #MicroblogMondays. For the other participants, click here.